To be honest, I would rather not write this post, but it needs to be written. It needs to be written because this problem plagues nearly every Christian family in the world. In nearly every one of our families there is someone who at one point pledged his or her allegiance to King Jesus by being baptized, but is now living in shameless rebellion to Christ. Should we just mind our own business? Should we rebuke them? Should we shun them? How would Jesus want us to handle these situations? Before we say or do anything, we need to pray. We need to be like Epaphras, who “struggled” in prayer on behalf of those he loved (Colossians 4:12). Are your prayers for your family members like wrestling matches with God? Do you plead with God in tears that He “may perhaps grant them repentance” (2 Timothy 2:25)? Pray for them, pray for yourself to know how to respond, ask others to pray for them, and ask others to pray for you. Saturate the situation in prayer. Love is unconditional, but it does not rejoice at wrongdoing. Love tells people the truth, but it is never arrogant or rude. Love is always patient and kind. No matter how angry or sad your family member’s sin makes you, be committed to loving them. Ask lots of questions. Don’t assume you have everything figured out. Speak kindly. Be patient. Give the benefit of the doubt. This is what love looks like. Remember that loving someone is less about how you feel and more about what you do and say. 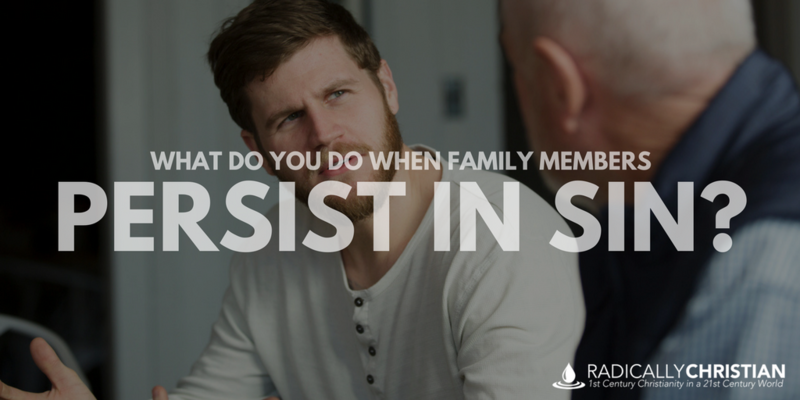 It is also incredibly important to define what it means to persist in sin. There will always be personal convictions about which you disagree; things you think your family members are doing wrong, because their behavior clashes with your culture, traditions, or inferences. Romans 14 and 15 teaches us how to handle these kind of disagreements. Furthermore, your family members will make mistakes along the way, just like you make mistakes. It is loving, and to your glory, to overlook people’s offenses (Proverbs 19:11). You don’t have to “make a federal case” out of every little thing someone does wrong. What we are talking about here is when a family member is unashamedly engaging in things like sexual immorality, idolatry, adultery, homosexual behavior, theft, greed, drunkenness, abusive behavior, or extortion (1 Corinthians 6:9-10). In other words, when a family member is on a path of spiritual self-destruction, that’s when something needs to be said and done. American culture has really distorted our view of the way families are supposed to work. We have almost completely abandoned the idea of patriarchs and matriarchs. We tend to believe that once a son or daughter reaches adulthood, they should be free to make their own decisions without interference. My question would be, where did we get that idea? In the biblical culture, the head of the household exercised a great deal of influence over adult family members (Acts 10:2; 16:15; 16:34; 18:8). Furthermore, adult children were expected to honor and even obey their parents (Romans 1:30; 2 Timothy 3:2). As far as God is concerned, parenting should not stop when a child becomes an adult. It changes, but it must not stop. At some point, parents – who have done everything within their power to correct their children – may have to take the matter to the elders of the church. Under the Old Testament, God’s covenant people had to do the same (see Deuteronomy 21:18-21). In that case, the discipline was far more severe; but for our children’s own sake, we need to allow the community of Jesus to hold them accountable. What an absolutely heartbreaking situation it would be to have to go to the elders of the church and say, “I cannot correct my son’s behavior. I need the church to join me in discipling him.” But we must do this when necessary “so that his spirit may be saved in the day of the Lord” (1 Corinthians 5:5). But remember, whether the family member is being disciplined by the family or by the church, we must never “regard him as an enemy, but warn him as a brother” (2 Thessalonians 3:15). The goal is NOT punishment, but repentance. Jesus’ story of the prodigal son in Luke 15 is one of Jesus’ most referenced – and most misunderstood – parables. The father in the story isn’t just a picture of God, but a picture of how God’s people ought to respond when family members repent. The father didn’t wait until the son had made his way all the way home. He didn’t wait until the son had cleaned himself up. He didn’t make his son prove his sincerity or go through a probationary period. No, when the father saw the son taking even the smallest steps of repentance, he ran to meet him and threw a party! That’s how we have to treat our family members. We have to be loving enough to let them walk away in sin, if that’s what they choose to do. But as soon as they take even the smallest step of repentance, we must run to meet them in forgiveness and reconciliation. Let’s take a moment right now and pray for the prodigals. Pray that they come back home and that they receive a warm welcome while they’re still on their way!